I had never seen this movie before but it was recommended as an 80's movie I should add to my list. 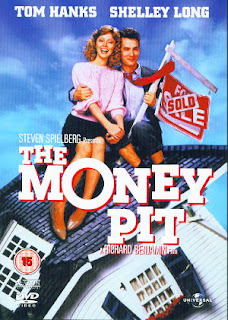 It's about a guy and his girlfriend trying to settle down into a new house, but the house they buy has problem after problem (thus the house is called a "money pit"). I thought the plot was promising, especially being a relatively new home owner myself and understanding the woes of home maintenance. And it was mildly entertaining and somewhat funny in parts... But in the end, it's just a dumb movie. You are crankin' these out! It's been a lot of late nights and hard work, but it's a fun excuse to pop popcorn and be a couch potato for a season. The list keeps growing as people tell me their ideas, so I know my time is limited if I want to get through them all.